I love this rug. It is soft and durable. It is made of natural materials, so no worries about outgassing. In lamplight or sunlight it looks as shown. On a cloudy day is is softly muted colors. Lend a touch of natural style to your decor with this hand-woven rug. 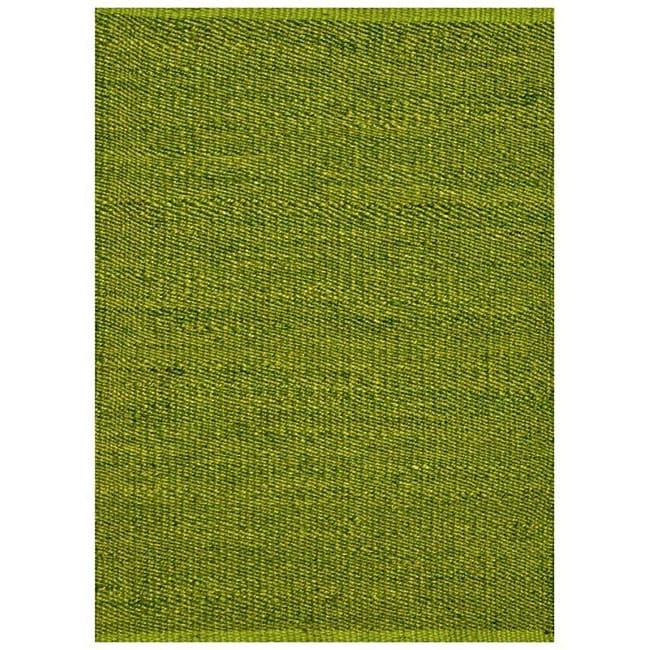 Constructed of durable jute, this area rug features a vibrant green hue. I love it! The color isn't exactly accurate, although it could look this green in certain lighting -- the rug I received is a slightly more muted, "natural" shade of green, which I believe is even better. It's still bright and eye-catching but less jarring of a piece than I had expected. If you were on the fence about buying a bright rug, this is a great piece. The woven pieces are greenish-brown and the rug is really comfortable to walk on considering it's jute. I stand on it barefoot all the time with no problems. It shipped well, in a long cardboard box. It's heavy but nothing that one person can't carry/drag on their own. Because of the jute material I knew it would be pretty hardy and not damage easily. It is rolled up, wrapped with twine strings, and bears a note card certifying not using child labor (a major issue with many rug industries). Highly recommend. I am in love with this rug. I was looking for a durable rug that could handle dogs and a lot of traffic on our screened in porch. The floor we have is stained espresso, so the green rug looks great against it. It is sturdy and easy to vacuum. It's also not as rough as I previously thought it would be nor as thick. It also shipped crazy quick! Love this rug! works great for our space! This rug is a pretty color and looks nice in my modern dining room. I am very disappointed in the color and the rug itself. It is a very dark and dingy looking color to me. I was very surprised at how fast it arrived, maybe just a couple days after I ordered it. I'm very happy with it and it was perfect for my dining rooom. It's not a solid green, there's shading of a yellow green in it but it realy adds to the look. "Approximately how much does this rug weigh?" The shipping weight of the Hand-woven Green Jute Rug (8' x 11') is approximately 50 pounds. "Is this hand woven green jute rug manufactured by Jaipur and is the color called bright lime calypso Havana?" Hello veryhappycustomer123, we are unable to disclose the manufacturer of some of our products; however, Overstock.com stands behind every product we sell. When necessary we can contact suppliers if a product issue arises. Thank you for shopping with us. "would you please send me a tiny sample of this rug"
Unfortunately, we cannot send samples of the rug.